After coming off the back of completing the Insanity training program I wanted an exercise routine that would give me a bit more bulk. Insanity had been great for giving me more of a lean, muscular, athletic physique, but I wanted to slap some more muscle onto my frame. My previous training background was always in weights, so I’m looking forward to getting back into the iron groove and going all out to build a bigger chest after so many years away. I really enjoyed the controlled schedule of Insanity, and the DVD-based training meant that I knew exactly how long each session was going to be. Working out at home also means that my workouts won’t be put on pause while I wait for machines or free weights to become available. Those are the main reasons why I leapt into the Body Beast program. 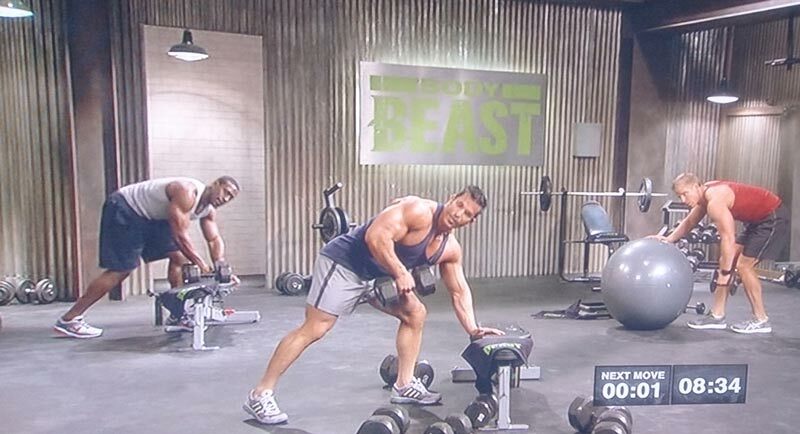 There are two different training options with the Body Beast system: Huge Beast and Lean Beast. The main difference is there’s more cardio in the Lean Beast training schedule. I decided to go down the Huge Beast route. Plenty of spirit and determination! After completing the Insanity program, this was a doddle. It’s less than 3 minutes and involves a bit of jogging, some arm circles then a few push-ups. That’s it, way more civilized than the blood and destruction of the Insanity warm up. Then we’re straight into the chest press, where it’s two normal sets followed by a drop set, where once you complete the exercise you jump straight into another set for maximum muscle stimulation. We jump straight into the next exercise: supersets consisting of incline fly and incline press, three sets of each in total. Oh yes, and with a superset locked on at the end for good measure. 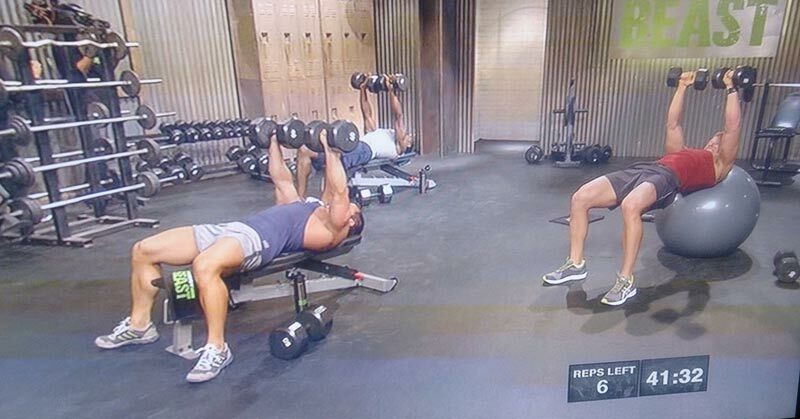 The incline flyes pre-exhaust your chest so that you get it working to its max on the dumbbell press. After all this my chest is ready to explode. I like the way the incline work really targets the upper part of the pectorals, with the flyes accentuating the centre line of the chest to pull out some striated definition. This is the first giant set of the session. Giant sets are a combination of three exercises in quick succession with hardly any rest in between. So, you do a set of 15 reps with light weight of close grip press, followed immediately with no rest by a set of 15 reps with light weight of chest fly, followed immediately with no rest by a set of 15 reps of decline pushups. Then you get a brief rest before hitting the giant set twice more. 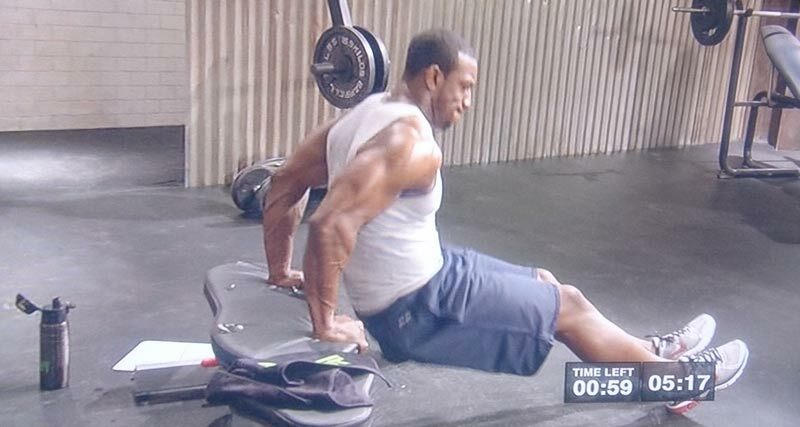 For triceps extensions, lay flat on the bench with a dumbbell in each hand. Position the weights by extending your arms straight up and then bending your elbows to lower the weights down behind your head. Make sure to keep your arms in tight towards your chest. Try hard not to hit yourself in the head! 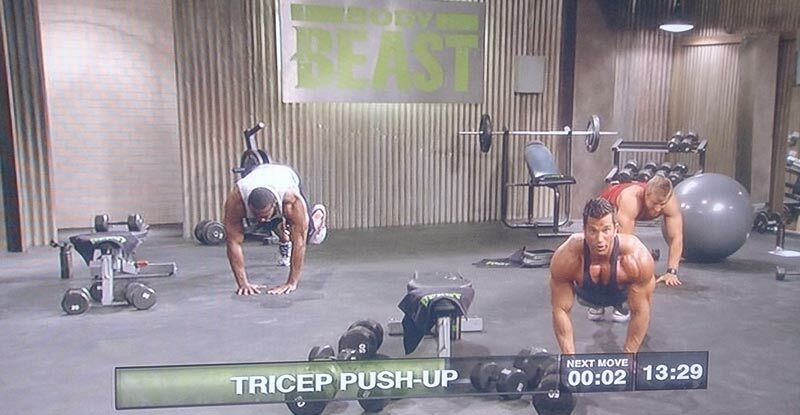 This superset really isolates those triceps, you’ll definitely have your arms screaming out for oxygen! It’s a great pair of exercises for carving out some muscle and definition, but make sure that you maintain your form throughout. For the kickbacks, lean on your bench and push the weight back while keeping your elbow stationary, really squeezing at the top of the motion. Repeat for each arm. 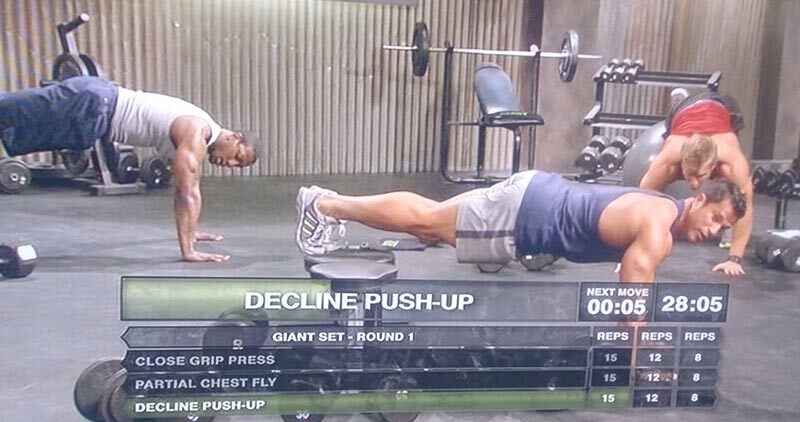 The triceps push-up is just a close width push-up. Keep your elbows tight to your body and bend your elbows back and not out during the push-ups. This is a set to complete failure. Instead of aiming for a set number of reps, you do as many as you can for 60 seconds. For the dips, use the bench, grabbing it behind you and your body in between your hands. Extend your feet straight out in front of you with your heels resting on the ground. Dip down as low as you can and push yourself back up. Keep your arms in tight to your body and bend your elbows back not out to the side. You will definitely feel your triceps burning! For the In and Outs, while sitting on the bench lift your legs, straighten them out and bring them back in using your hip flexors. Continue doing this for 60 seconds. This really did hit my abs hard. This is very quick and can’t really be considered a cool down, particularly if you compare it with the Insanity sessions. It’s around 2.5 minutes and stretches your chest muscles, triceps and shoulders, mostly using the bench to push against. I think as I progress with the Body Beast workout I’m going to have to add in some more of my own cooldown time, just to make sure that I don’t incur any injuries. Comparing this with Insanity, it’s a lot slower and less intense, but then I’d expect that moving from cardio into weights. I’m so glad I bought a set of Orbus adjustable dumbbells or I would have been running around grabbing weights all the time, undoing dumbbell collars, spending too much time between sets and having to pause the video. It’s great that I was just able to get stuck in and focus on the workout. Have you done this workout? Let me know how you got on, I’d love to hear from you. What was your favourite exercise and was there anything that got the better of you? Get in touch and tell me your story. Regarding chest workout I love bench press and I really love skull crushers and standing triceps press down as this workouts really squeezes and targets our triceps muscles and thus our triceps get bigger and muscular.